The "Neoolithic" also known as "The New Stone Age"
This is the period of the first farmers when the wild forest that had developed since the melting of the glaciers began to be cut down. Initially, rather like 'slash and burn' agriculture in the Amazon today, humans had little impact on the environment. By the later Neolithic, however, parts of the country were becoming cleared and great earth monuments were being erected, such as the long barrow found at Badshot Lea, near Farnham. In the Bordon/Whitehill area a number of stone implements have been found including leaf-shaped arrowheads and polished flint axes, which indicate the presence of farmers at this period. More general information about this period is shown below the map. The Neolithic was the period of domestication of plants and animals. There is a current debate between those who believe that the introduction of farming and a sedentary lifestyle was brought about by resident peoples adopting new practices, and those who hold the opinion that it was effected by continental invaders bringing their culture with them and, to some degree, replacing the indigenous populations. Analysis of the mitochondrial DNA of modern European populations shows that over 80% are descended in the female line from European hunter-gatherers. Less than 20% are descended in the female line from Neolithic farmers from the Middle East and from subsequent migrations. The percentage in Britain is smaller at around 11%. Initial studies suggested that this situation is different with the paternal Y-chromosome DNA, varying from 10 - 100% across the country, being higher in the east. This was considered to show a large degree of population replacement during the Anglo-Saxon invasion and a nearly complete masking over of whatever population movement (or lack of it) went before in these two countries. However, more widespread studies have suggested that there was less of a division between Western and Eastern parts of Britain with less Anglo-Saxon migration. Looking from a more Europe-wide standpoint, researchers at Stanford University have found overlapping cultural and genetic evidence that supports the theory that migration was at least partially responsible for the Neolithic Revolution in Northern Europe (including Britain). The science of genetic anthropology is changing very fast and a clear picture across the whole of human occupation of Britain has yet to emerge. The arrival of farming and a sedentary lifestyle as shorthand for the Neolithic is increasingly giving way to a more complex view of the changes and continuities in practices that can be observed from the Mesolithic period onwards. For example, the development of Neolithic monumental architecture, apparently venerating the dead, may represent more comprehensive social and ideological changes involving new interpretations of time, ancestry, community and identity. The construction of the earliest earthwork sites in Britain began during the early Neolithic (c. 4400 BC - 3300 BC) in the form of long barrows used for communal burial and the first causewayed enclosures, sites which have parallels on the continent. The former may be derived from the long house, although no long house villages have been found in Britain - only individual examples. The stone-built houses on Orkney - such as those at Skara Brae - are, however, indicators of some nucleated settlement in Britain. Evidence of growing mastery over the environment is embodied in the Sweet Track, a wooden trackway built to cross the marshes of the Somerset Levels and dated to 3807 BC. 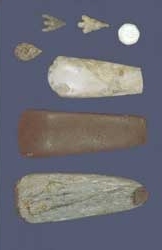 Leaf-shaped arrowheads, round-based pottery types and the beginnings of polished axe production are common indicators of the period. Evidence of the use of cow's milk comes from analysis of pottery contents found beside the Sweet Track. The Middle Neolithic (c. 3300 BC - c. 2900 BC) saw the development of cursus monuments close to earlier barrows and the growth and abandonment of causewayed enclosures, as well as the building of impressive chamber tombs such as the Maeshowe types. The earliest stone circles and individual burials also appear. Different pottery types, such as Grooved ware, appear during the later Neolithic (c. 2900 BC - c. 2200 BC). In addition, new enclosures called henges were built, along with stone rows and the famous sites of Stonehenge, Avebury and Silbury Hill, which building reached its peak at this time. Industrial flint mining begins, such as that at Cissbury and Grimes Graves, along with evidence of long distance trade. Wooden tools and bowls were common, and bows were also constructed. Were constructed as earthen or drystone mounds with flanking ditches and acted as funerary monuments during the Early and Middle Neolithic periods (3400-2400 BC). They represent the burial places of Britain's early farming communities and, as such, are amongst the oldest field monuments surviving visibly in the present landscape. Where investigated, long barrows appear to have been used for communal burial, often with only parts of the human remains having been selected for interment. Certain sites provide evidence for several phases of funerary monument preceding the barrow and, consequently, it is probable that long barrows acted as important ritual sites for local communities over a considerable period of time. Some 500 long barrows are recorded in England. As one of the few types of Neolithic structure to survive as earthworks, and due to their comparative rarity, their considerable age and their longevity as a monument type, all long barrows are considered to be nationally important.